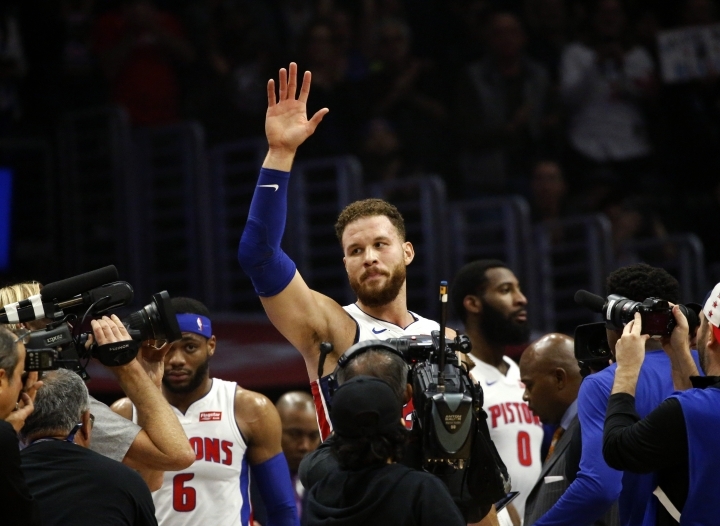 LOS ANGELES — Blake Griffin scored 44 points in his return to Staples Center for the first time against his old team and the Detroit Pistons beat the Los Angeles Clippers 109-104 on Saturday to snap a four-game skid. Andre Drummond had 20 points and 21 rebounds for the Pistons. Danilo Gallinari led the Clippers with 23 points. PHOENIX — Kelly Oubre Jr. matched his career high with 26 points for the second time in three games and Phoenix beat Denver, a victory for the team with the worst record in the Western Conference over the team with the best. Oubre also tied his career best with 11 rebounds. Deandre Ayton added 23 points and 13 rebounds for the Suns. They have won two of three with Devin Booker sidelined with back spasms. Nikola Jokic had 21 points and 10 rebounds for the Nuggets. Denver fell to just a half-game ahead of Golden State for best record in the West. MINNEAPOLIS — Karl-Anthony Towns had 27 points and a career-high 27 rebounds to help the Minnesota Timberwolves hold off Anthony Davis and New Orleans. Davis had 30 points and 14 rebounds for his 13th consecutive double-double. Jrue Holiday added 25 points and seven assists for the Pelicans. ORLANDO, Fla. — Aaron Gordon had 28 points and 12 rebounds and Orlando held off Boston. Jayson Tatum missed a jumper at the buzzer that would have tied it for the Celtics. They charged back from a nine-point deficit in the final 1:43 before losing to the Magic for the second time this season. Kyrie Irving scored 25 points for the Celtics, 10 of them from the foul line in the final 4:31. Nikola Vucevic added 16 points and 13 rebounds for Orlando. OKLAHOMA CITY — Dennis Schroder scored all of his 19 points in the second half to help Oklahoma City beat San Antonio. Russell Westbrook had 24 points, 10 rebounds and eight assists for Oklahoma City. The Thunder bounced back from a 154-147 loss in double-overtime loss to the Spurs on Thursday night. Marco Belinelli scored 24 points, and DeMar DeRozan added 18 points for the Spurs. LaMarcus Aldridge had 17 after scoring a career-high 56 points Thursday. MIAMI — Justise Winslow scored 26 points, Dwyane Wade had a huge blocked shot in the final seconds and Miami beat Memphis. Wade blocked a potential tying layup by Shelvin Mack, then won a jump ball to help the Heat escape. Wade scored 10 points to help Miami reached the midpoint of the season at 21-20. JaMychal Green had 24 points and 11 rebounds for the Grizzlies. SALT LAKE CITY — Donovan Mitchell scored 34 points, his third straight game with more than 30, to help Utah pull away from Chicago. SACRAMENTO, Calif. — Bogdan Bogdanovic scored 22 points, Willie Cauley-Stein had his second straight double-double with 12 points and 12 rebounds, and Sacramento beat road-weary Charlotte.